When I was a young child I would sit on the steps of my Dad’s shop and watch him work with wood. Over many years he remodeled our entire house building all the cabinets and some of the furniture. I was his helper and I learned a lot by watching. When I got older I started working in the shop when he was at work. I was only allowed to use hand tools but when my mother left the house I sometimes would use the power tools. I worked during the summers until I entered the Novitiate. During this period I also did a lot of work for my Mother refinishing antique furniture that she would purchase at auctions. After Simple Profession I was sent off to school in St. Louis at Saint Louis University. The house of studies that we lived in had a basement room that I converted into a shop. All I had was hand tools but I was able to do a lot of simple projects for the house. After graduating from college in 1968 I was assigned as a teacher in the Academy. Besides teaching I was assigned to take care of Benedict Hall (Wardlaw Hall). I put my carpenter skills to use making things for the newly renovated Benedict Hall. I found a room on the fourth floor of the monastery and set up a shop and started collecting tools. With money from the school and some donations I set up a student shop in the room next to Bunkerstube. After school and on Saturdays I opened for students and taught them how to make items out of wood. During this time I developed an interest in the turning lathe.I was able to purchase a small lathe and I learned enough to start teaching students to turn. A much better lathe was donated several years later which made it possible to turn larger items. In the late 1970’s I was assigned to the Carpenter Shop and I moved the tools I acquired to the present shop. Some of them are still being used today. I continued to work with students after school and on Saturdays teaching them about woodworking. Also at this time I did a lot of maintenance work for the Academy and Abbey at this time. I taught many students how to turn on the lathe over the years. I know of former students who still turn and I am always glad to see what they are turning. Many have progressed beyond my ability. With my work in the Academy shifting from teaching to computer work I had less time for turning. Within the last three years I have more time for turning and have learned many new techniques. Also a new heavy duty lathe donated by Les Harter has opened up a lot of possibilities for new types turnings. I try to spend a lot of time over the Christmas vacation turning objects that I give to Catholic Schools and parishes for fund raisers. When I am turning over Christmas break at times I think of myself as Santa Claus making bowls and vases to be given away. 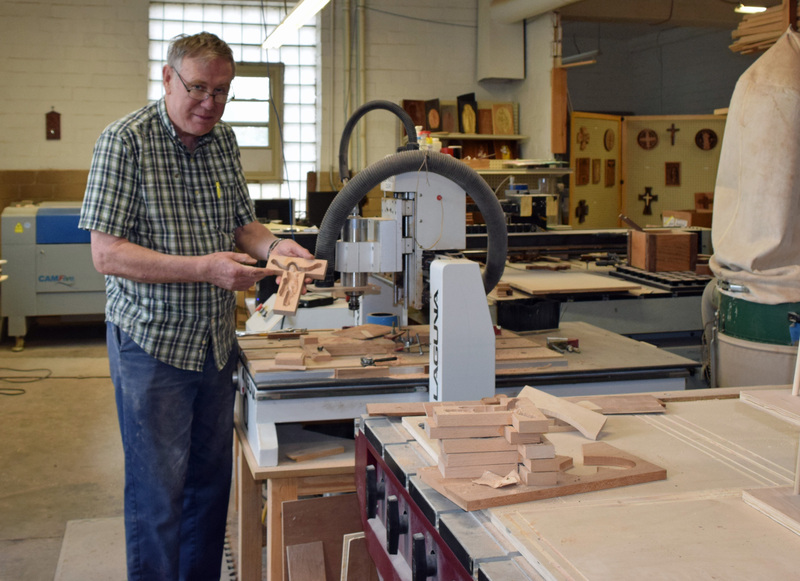 With the gift of a CNC router by Richard Grace the carpenter shop jumped to a new level of possible projects. I am interested in combining my lathe work with carving on the CNC router. I have so many ideas of things to make and so little time. I am already looking forward to and drawing plans of things to make during Christmas vacation.